A businessman, who has poured tens of thousands of pounds into some of Bexhill’s most popular events over the years, is bidding farewell to his beloved town after more than three decades. Alastair Hazell was brought up in Bexhill from the age of three and gained a love for the town from his father, Brian Hazell, who brought joy to many through the 1990s and early 2000s as the founder and one of the main organisers of the Bexhill 100 Festival of Motoring. Alastair later took up the mantel and made a sizeable contribution to the town’s tourism industry with his nonprofit website, Discover Bexhill. He said: “Since I built the first design of Discover Bexhill in 2003 it has stood tall and proud as Bexhill’s biggest promotional tool. “During its 13 years it successfully generated well over £1m in accommodation bookings and had an impact on Bexhill’s visitor economy of several times that figure. Now, having sold his health information business, Alastair and his family are to move away to start their next chapter. 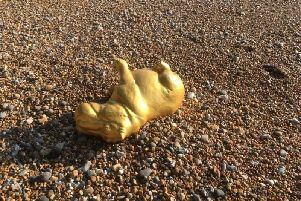 But Alastair has left his mark on Bexhill. He said: “Although I’ve not previously wished to publicise it, I have over recent years personally injected many tens of thousands of pounds of funding into Bexhill events such as the Bexhill Festival of the Sea, Bexhill Roaring 20s, Bexhill Lions Triathlon and many others. Without this funding, two of Bexhill’s major events would have struggled to get out of the starting gates. Alastair says he has been touched by the farewell messages from residents. He said: “I’ve been touched to read all the lovely comments on Facebook. Ahead of his departure, Alastair made donations of £3,500 to Charity For Kids, a Bexhill-based charity helping sick and disabled children, and £3,000 to the Mallydams Wood RSPCA Centre.